Mormonism began in 1820, when Joseph Smith, Jr. purportedly received a vision of two heavenly beings claiming that all churches had become corrupted and that their creeds were abominations. Smith’s divinely ordained duty was to restore the one true church. He claimed three years later an angel, named Moroni, paid him a visit, showing him the location of gold plates containing the true, eternal gospel. Written in “reformed Egyptian” hieroglyphs, this golden book contained the Book of Mormon, which Smith translated with a pair of magic spectacles. 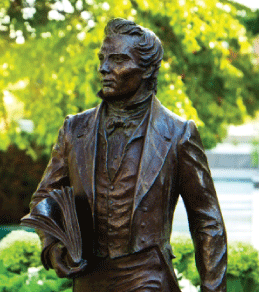 Seven years later in 1830, the Mormon church became a recognized entity for the first time. The Mormons are a growing group which many people have labeled a “Christian denomination.” This is the longstanding position of the Church of Jesus Christ of Latter Day Saints (LDS), and continues to be promoted today (Hickenbotham, 1995, p. 5). Unfortunately, Mormonism bears the hallmarks of a manmade religion, one of which is the reinvention and reinterpretation of an existing religion. Mormonism takes Christianity and reinterprets it. Mormonism’s divergences from true Christianity include: Jesus being Lucifer’s spiritual brother, the denial of the Trinity, and the belief that the faithful will one day become gods. The God of Mormonism is not the one true god of the Universe, but merely one god among many. Smith once called the Book of Mormon “the most correct of any book on earth, and the keystone of our religion” (Smith, 1902, 4:461). In the introduction of the Book of Mormon, Smith states that it is “the record of God’s dealings with the ancient inhabitants of the Americas,” which also contains “the fullness of the everlasting gospel.” Any religion centered on a scriptural foundation stands or falls on the accuracy of its sacred text. While the Bible has a wealth of evidence supporting its historical, chronological, and geographical accuracy, the Book of Mormon has been heavily criticized for its inaccuracies. Is the Book of Mormon divine revelation, or is it simply the invention of a gifted storyteller? One of the problems that plagues the Mormon scriptures is the anachronistic portrayal of various animals in the New World. The most problematic is the portrayal of horses in the Americas in the Book of Mormon, where they appear frequently prior to the age of exploration (1 Nephi 18:25, et al.). Anthropologists are in near-universal agreement that horses had become extinct in the Americas until European explorers reintroduced them to the continent. Scientists have found evidence of horses in the Americas prior to and after the period of time covered by the Book of Mormon, but not during. In addition to a lack of fossil evidence, Bruce MacFaden says, "Their extinction is…suggested by the fact that no horses are known to have been depicted in pre-Columbian art…. Horses were reintroduced into the New World by the Spanish explorers during the sixteenth century" (MacFaden, 1992, p. 3). Janey Dohner notes that the horse was reintroduced to North America by Columbus on his second voyage, while Hernando de Soto reintroduced them to South America in 1539 (Dohner, 2001, p. 313). Mormon author Diane Wirth dismisses this criticism and points to what she considers evidence of the presence of horses, although her best examples consist of a handful of poorly executed relief carvings and petroglyphs (Wirth, 1986, pp. 52-55). Wirth defends her point by drawing a parallel between the lack of evidence, particularly bone evidence, of horses in the Americas with the lack of evidence of lions in Palestine. She notes: “Today there are no so-called archaeological remains of lions in the land of Israel. Apparently not a bone has been left. Therefore, a lack of skeletal remains of an animal in a particular area does not necessarily mean that the animal was never there” (p. 56). Wirth is correct. If one were to rely purely on skeletal evidence, the existence of lions in Palestine would be nearly impossible to prove. But archaeologists have also discovered numerous reliefs depicting kings hunting lions, lion-shaped artifacts, and numerous references to lions in ancient texts. There is a wealth of evidence attesting to the existence of lions in ancient Israel. There is absolutely no parallel for the existence of horses in America prior to European exploration. This is not to say that the Book of Mormon is wrong because of a lack of evidence--which would be an argument from silence. Rather, it is simply to note that there is an inexplicable lack of evidence where it would be reasonably expected. The lack of evidence of horses has prompted a shift in tactics on the part of Mormon apologists, who claim that the settlers in the New World would have called some other animal a “horse,” most likely the tapir. Tapirs have toes rather than hoofs and are pig-like in appearance, including a short, thick neck and stubby tail. They are also smaller than horses. It is highly unlikely that one could have been mistaken for the other--and if the Book of Mormon was inspired, such mistakes would not have been made. Steel was also unknown in the New World prior to the arrival of European explorers, yet the Book of Mormon mentions the use of both iron and steel (2 Nephi 5:15; Ether 7:9). A particularly noteworthy reference concerns a military leader named Laban, who is described as having a steel sword with a gold hilt (1 Nephi 4:9). While New World peoples did have metallurgy, it lagged behind the technological developments in the ancient Near East. Studying evidence from South America, Purdue University archaeologist Kevin J. Vaughn notes: “Even though ancient Andean people smelted some metals, such as copper, they never smelted iron like they did in the Old World.... Metals were used for a variety of tools in the Old World, such as weapons, while in the Americas, metals were used as prestige goods for the wealthy elite” (Purdue University, 2008). People in the New World did make use of copper and precious metals like gold and silver, but scientists believe ironworking did not emerge until about A.D. 800. Moroni supposedly showed Smith the location of gold plates, upon which were written the text of the Book of Mormon. Smith claimed it was written in “Reformed Egyptian.” The only problem here is that this language does not exist. “Reformed Egyptian” is not a language found in the ancient world. Ancient Egyptian had numerous dialects (Archaic, Old, Middle, Late, Demotic, and Coptic), but a “reformed” dialect was not one of them. Smith may have chosen Egyptian as his text because he was unaware that French scholar Jean Francois Champollion had recently deciphered the language (the first translation of the Rosetta Stone was not published until 1822). Until that time, hieroglyphs were mysterious and unknown. Although it is speculative to say, Smith may have thought that the language was unreadable and would remain so, and therefore believed his grand story would never be proven false. Modern Egyptology has discredited Mormon scriptures such as the Book of Abraham, which depicts the patriarch’s journey to Egypt. His travels include nearly being sacrificed by an evil priest and later being honored by the pharaoh. The book was published with three facsimiles taken from an ancient papyrus, which was lost. Far from being inspired scripture, the Book of Abraham was shown to be a fraud years later when the papyrus was rediscovered. The book is based on a funerary papyrus depicting several scenes from the Egyptian Book of the Dead. In Facsimiles Nos. 1 and 3, Smith misidentifies virtually everything depicted in these scenes, demonstrating his attempts were nothing more than uneducated guesswork. He had virtually no familiarity with Hebrew or Egyptian names, and seemed to have made up names that sounded sufficiently biblical to be believable (although many of his spellings are impossible in biblical Hebrew, which exposes them as inventions as well). He guessed at the names of the pagan deities, getting every one of them incorrect. For instance, in Facsimile 1 he misidentified the deities on the canopic jars (which held the internal organs of the deceased) in the scene (from left to right) as Elkenah, Libnah, Mahmackrah, and Korash. The gods should have been identified as Qebesenuef, Duamutef, Hapi, and Imseti. It is not likely that he even knew that the objects depicted were canopic jars. He likely thought of them as idols, since he misidentified the scene as sacrificial rather than funerary in nature. In addition to linguistic and historical evidence, the sciences have not been kind to Mormon beliefs. From the field of archaeology, nothing in the Book of Mormon has ever been discovered, though Smith painted a picture of vast civilizations with major urban centers and populations ranging in the millions (the Jaredites are a people group who lost two million soldiers in one war). At one point, some members of the LDS church claimed that the Smithsonian Institute had used the Book of Mormon as a scientific guide for locating archaeological sites. The Smithsonian adamantly denied this was the case in 1986. The National Geographic Society did the same in 1982. Similar claims issued by the LDS church prompted Mormon anthropologist Dee Green to say, “The first myth we need to eliminate is that Book of Mormon archaeology exists,” even conceding that 20 years of research “left us empty-handed” (Green, 1969, pp. 77-78). So far, DNA research lends no support to the traditional Mormon beliefs about the origins of Native Americans. Instead, genetic data have confirmed that migrations from Asia are the primary source of American Indian origins. This research has substantiated already-existing archaeological, cultural, linguistic, and biological evidence (Murphy, 2002, p. 48). Murphy was nearly excommunicated in 2003 by the president of the Lynwood LDS Stake for his work [NOTE: a stake is the rough equivalent of a diocese in the Roman Catholic Church.] Only popular support for Murphy prevented Latimer from following through with the excommunication (Kennedy, 2003). Latimer postponed the disciplinary hearing indefinitely, in part, for fear of negative publicity. the data accumulated to date indicate that 99.6 percent of Native American genetic markers studied so far exhibit Siberian connections…. There has been little if any evidence seriously considered by the mainstream, scientific community that would indicate a Middle East origin, or any other source of origin, for the majority of contemporary Native Americans (Meldrum and Stephens, 2003, p. 41). There is an inherent improbability in specific items that are mentioned in the Book of Mormon as having been brought to the New World by Jaredites and/or Nephites. Among these are the horse...the chariot, wheat, barley, and metallurgy (true metallurgy based upon smelting and casting being no earlier in Mesoamerica than about 800 A.D.). The picture of this hemisphere between 2,000 B.C. and A.D. 421 presented in the book has little to do with the early Indian cultures as we know them, in spite of much wishful thinking. There is also little doubt in the minds of non-Mormon scholars that Joseph Smith had no ability whatsoever to read “Reformed Egyptian” or any other kind of hieroglyphs. The papyri translated as the Book of Abraham in the Pearl of Great Price are, in the opinion of qualified Egyptologists, a series of fragments of the Egyptian “Book of the Dead,” something which Smith could not have known since Champollion’s decipherment of the Egyptian script had not yet been published (Coe, 1973, p. 42). Coe, Michael D. (1973), “Mormons and Archaeology: An Outside View,” Dialogue: A Journal of Mormon Thought, 8:40-48, Summer. Dohner, Janet Vorwald (2001), The Encyclopedia of Historic and Endangered Livestock and Poultry Breeds (New Haven, CT: Yale University Press). Green, Dee F. (1969), “Book of Mormon Archaeology: The Myths and the Alternatives,” Dialogue: A Journal of Mormon Thought, 8:77-78, Summer. Hickenbotham, Michael W. (1995), Answering Challenging Mormon Questions (Bountiful, UT: Horizons). Kennedy, John W. (2003), “Mormon Scholar Under Fire,” Christianity Today, http://www.christianitytoday.com/ct/2003/march/14.24.html. Larsen, Charles M. (1985), …By his Own Hand Upon Papyrus: A New Look at the Joseph Smith Papyri (Grand Rapids, MI: Institute for Religious Research). MacFaden, Bruce J. (1992), Fossil Horses: Systematics, Paleobiology, and Evolution of the Family Equidae (Cambridge: Cambridge University Press). Meldrum, D. Jeffrey and Trent D. Stephens (2003), “Who are the Children of Lehi?” Journal of Book of Mormon Studies, 12:38-51. Miller, Dave (2009), "Is The Book of Mormon From God? Parts I and II," Reason & Revelation, 29:66-71,73-79, http://www.apologeticspress.org/apPubPage.aspx?pub=1&issue=617. Miller, Dave (2011), "Is Christianity Logical? (Part I)," Reason & Revelation, 31:50-59, http://www.apologeticspress.org/apPubPage.aspx?pub=1&issue=977. Murphy, Thomas W. (2002), “Lamanite Genesis, Genealogy, and Genetics” in American Apocrypha: Essays on the Book of Mormon, ed. Dan Vogel and Brent Lee Metcalfe (Salt Lake City, UT: Signature Books), pp. 47-77. Purdue University (2008), “Archaeologist ‘Strikes Gold’ with Finds of Ancient Nasca Iron Ore Mine in Peru,” February 3, http://www.sciencedaily.com­/releases/2008/01/080129125405.htm. Smith, Joseph, Jr. (1902), History of the Church of Jesus Christ of Latter-day Saints, ed. B.H. Roberts (Salt Lake City, UT: The Church of Jesus Christ of Latter-day Saints), second edition. Wirth, Diane E. (1986), A Challenge to the Critics: Scholarly Evidences of the Book of Mormon (Bountiful, UT: Horizons).